We never know who’s going to walk into our lives and change it. Or in the case of netizen Angelique Stephanie Pasion, who would sit beside her and completely alter her world view. 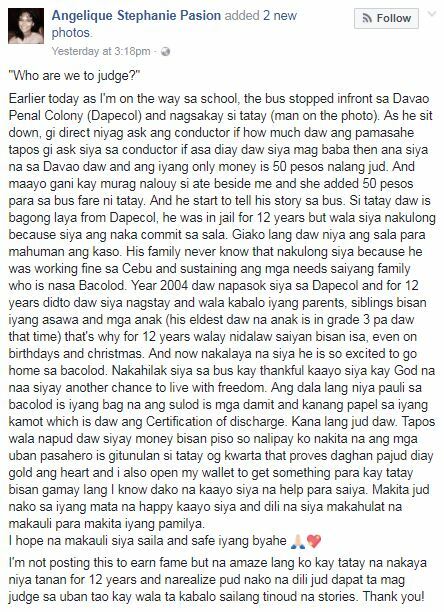 It started simply enough for Pasion, with an old man boarding the bus she was on in front of Davao Penal Colony or Dapecol. 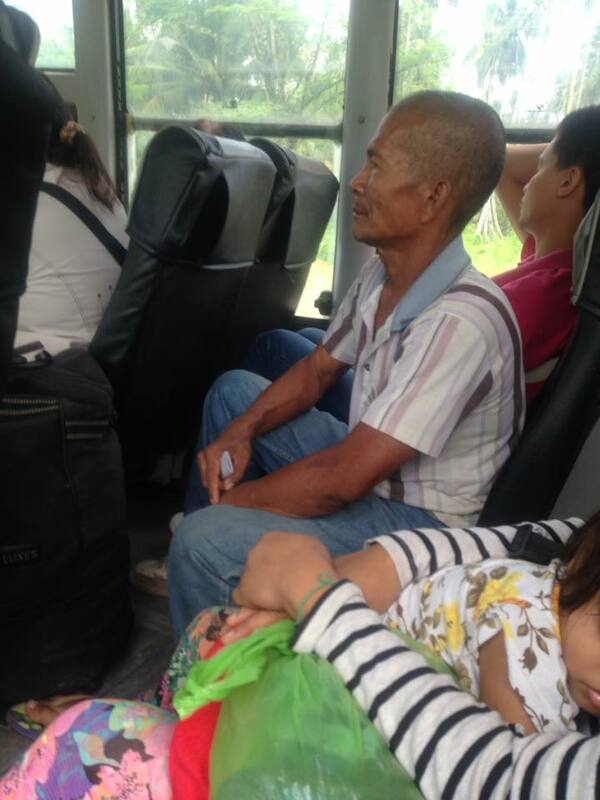 “Tatay,” as she called him, asked the conductor if he could go to the city with only 50 pesos, as it was the only money he had. 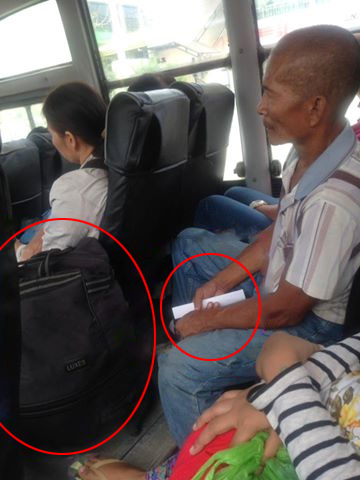 Pasion gave the old man an extra 50, so that he may continue his journey. He then started sharing his incredible story. Tatay, as it turned out, was going home after spending 12 years in prison for a crime that he was wrongfully accused and imprisoned for. He said that he only admitted to the crime so that the case might be closed. Even sadder, he didn’t let his family know the truth– all this time, he told them that he was working in Cebu, managing to even send money home so that they won’t worry. Of course, what this means is no one had ever visited him while he was serving time; not for Christmas or birthdays. His eldest child was in the third grade when he left and now, he had nothing but a small bag and his dispatch papers from the penal colony. 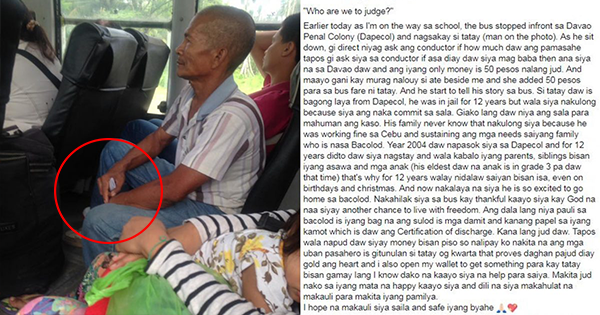 The passengers were all touched by his story and opened their hearts and wallets to the old man, wishing him well and hoping that he may have enough to go home to Bacolod. Pasion’s status ends with a plea for all of us to stop judging our fellow men as we don’t know their stories and the truth behind their actions. As of writing, this story has gained 118 thousand reactions, 16,000 comments, and almost 30,000 shares. Did this post touch your heart, too? Do you have any similar stories? Tell us all about it in the comments section!